"There are multiple different kinds of ways to play the tambourine. Some players play with just the hands, some enjoy just shaking it in the air instead of against something else, and others enjoy striking the instrument against the thigh or hip to produce a more muted sound. The best way to learn which method works best for you is to buy one, try a couple of different styles and see which one works best for you." Tambourines are one of the oldest instruments in the world. In fact, they date back to the time of the pharaohs. The instrument was invented in Ancient Egypt and was used there by the ancient Hebrews. In fact, the tambourine is one of a handful of instruments that is still in existence today which is written about in the Bible, where it was referred to in biblical Hebrew as a “tof.” It can be seen in musical scenes from Ancient Greek pottery and Roman mosaics, as well as more recent paintings from the European Renaissance. On top of that, you can spot the tambourine in Middle Eastern and African art from across the centuries as well. So what exactly are these historical instruments? They are hand percussion instruments, circular, usually with a radius of about a foot, made generally of wood or plastic, and have a drumhead and also metal jangles which are referred to as “zils.” Tambourines produce a bright, yet complex sound that can add levels and layers to the percussion section of a live show or a recording. So many cultures on the planet have some version of a tambourine and from the pandeiro in Brazil to the riq in the Arabian Peninsula to the buben in Ukraine to the tar in Turkey to the kanjira in India to the rebana in Malaysia and Indonesia, countries all over the world boast their own types of tambourine and the instrument can be heard on records made all over the world. Bands and artists in America such as The Head and the Heart and Phil Collins have made the tambourine famous, and of course there is the famous Bob Dylan song Mr. Tambourine Man, which paid tribute to his friend and famous guitarist, Bruce Langhorne, who used to travel around Greenwich Village in New York City during the early 1960’s with a tambourine under his arm. A popular use of a tambourine is to mount it to the drum set in order to add another percussion instrument to the drum kit. This has been a popular method used by drummers such as Ringo Starr of the Beatles, Larry Mullen Jr. of U2 and John Bonham of Led Zeppelin. The addition of a tambourine to a drum kit provides a jangly lightness that is easily achievable with this one simple step. While it is popular instrument with drummers, the lead singers of bands also use it while they sing, and it has been used in shows and records by Freddie Mercury of Queen, Trent Reznor of Nine Inch Nails, Stevie Nicks of Fleetwood Mac and the great Roger Daltrey of the Who. Even though the tambourine is highly popular in Western rock and pop music, its history dates back to a much earlier usage in Western Music. Wolfgang Amadeus Mozart used the instrument in many of his compositions. Nearly a hundred years later, the Russian composer Pyotr Ilyich Tchaikovsky used the tambourine in his famous piece The Nutcracker, which is popular every year during the holiday season. Around the same time, German composer Gustav Holst used the tambourine in his magnum opus The Planets, in which he wrote a piece of music that was themed for each of the planets. The tambourine is most prevalent in the piece of music he wrote for the planet Jupiter. As you may be able to tell, the tambourine is a phenomenally versatile instrument which can fit in all types and genres of music. 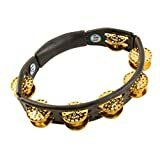 So whether you’re into classical music, world music, or rock and roll, don’t worry, a tambourine is a fitting addition to any of the musical arsenals used to play any of those genres. 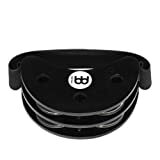 Tambourines are generally a pretty cheap instrument, especially compared to other instruments like guitars, pianos or stringed instruments which can cost in the thousands of dollars. You will be able to find a tambourine for less than ten dollars, whereas more expensive models can be had for around $40. Any decent music store, either brick and mortar or online, will have tambourines for sale and they should not be any trouble at all to find. Even toy stores will likely sell tambourines, if you are looking for an entry-level model or a great birthday gift for a musically inclined child. As it is a cheap option, there’s no harm in buying one for a child who you think has some musical talent. They may grow up to be the next Mr. Tambourine Man (or Ms. Tambourine Woman!). Generally, fancier tambourines are ones made of wood, and very nice models have animal skins as the drumheads. Sometimes the drumhead will have patterns or designs, but more often than not, they will be just blank or white. A recent development is a clear drumhead, which is becoming more and more popular these days. However, these days the most common iteration of the tambourine is the type used in rock music which is a ring that features jingles but is headless. Sometimes these are shaped like half circles instead of full rings, as well. 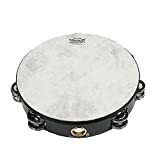 If the idea of mounting a tambourine on a drum kit is especially appealing, there are tambourines that are made especially for that purpose which are easier to mount than a typical hand-held and hand-played version.